In the beginning, yoga seems to be all about body parts. Postures are like puzzles, and figuring out how to position the arms, legs, hips and shoulders is challenge enough to keep us focused and engaged. A satisfying sense of exhilaration arises simply from stretching the body in new and different ways. As one’s practice evolves, yoga takes on a richer flavor. Feelings of integration develop as we begin to sense a deeper connection among various aspects of our lives. We feel less like a machine made up of fragmented body parts and more like a wholesome, authentic and expressive creature. We begin to move and breathe with a satisfying sense of harmony and accord. And this invites grace and beauty to reveal themselves in even the simplest of our daily tasks. 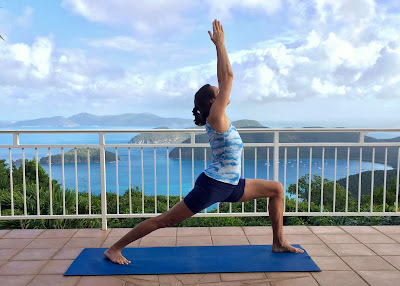 One of the most magnificent of all yoga postures, virabhadrasana one, or warrior pose, offers a perfect opportunity to explore this rewarding sense of integration and unity within. Both earthy and exhilarating, this asana cultivates balance, agility and coordination. It also invites deep concentration, encouraging the scattered pieces of ourselves to be transformed into a radiant and tranquil vessel for the heartfelt expression of life. Who wouldn’t say yes to an opportunity to feel harmonious and at ease in one’s skin at least once every day? Before we explore the rich and expansive qualities of virabhadrasana, we do need to focus on a few essentials. Form is important, after all, and careful attention will lay the foundation for buoyant vitality to flow freely through us. We’ll consider the top half of warrior pose first. Stand with your feet wide enough apart so that when you stretch out your arms at shoulder height your ankles are directly beneath your wrists. Place your hands on your hips, pausing to gently massage the bony points at the top front of your pelvis. If necessary, adjust the pelvis so these hip points are even - one shouldn’t be much higher than the other or closer to the wall in front of you. Invite a sense of enthusiasm to trickle upward from the deep belly as you gently release your tailbone in the opposite direction toward the earth. Imagine your spine is filled with champagne bubbles, and let that effervescence kindle feelings of ease and exhilaration within. Inhale as you joyfully stretch the arms overhead, hands shoulder-distance apart and palms facing one another. Breathe steadily as you invite the heart to gaze upward, fueling a sense of liveliness in your core. Let the arms feel rooted in the belly so you reach upward not just with your fingers but the entire length of your upper body. Note the graceful symmetry and extension from the hips all the way up through the fingertips. Remain here for a few breaths and then exhale as you settle your arms back down to your sides. Do you feel a little longer in your spine and lighter in your heart than a few moments ago? Now let’s try the same exploration with the legs in a more challenging, asymmetrical stance. With your hands on your waist and your legs still wide, begin revolving your upper body toward the left. At some point along the way, you’ll notice that the position of your legs impedes your progress. When this happens, turn the left leg outward 90 degrees and the right leg inward so you can spin your torso more fully to face the left wall. Take a small step outward with your back foot to give your hips a little more freedom and ease. Rise up onto the toes of your back foot and readjust the body so that the chest faces toward the wall beyond your left toes. Breathe comfortably and easily as you acclimate to this new position. Maintain a sense of elegance in the upper body as you slowly release the back heel toward the ground. Yogis like to argue about just how position the pelvis in virabhadrasana. Some insist that we keep the two sides of the pelvis equidistant from the wall in front of us, moving the hips, spine and shoulders as one single unit. Others suggest that in order to preserve the integrity of the spine and keep the sacro-iliac joints in the lower back happy, it is best to let the pelvis rotate toward the right a bit, following the lead of the back leg. I like to focus on keeping the chest evenly looking forward, and let my hips arrange themselves in an open, organic and steady way. Letting the back hip release open a bit feels steady and satisfying to me. Feel free to do the homework in your own body and see what works best for you. Now return to your earlier exploration of the effervescent upper body, extending the arms enthusiastically overhead. Let the arms be long and buoyant, hands shoulder-distance apart and palms facing one another. Pause here for a few breaths, releasing your tailbone toward the back heel while inviting your heart to grow light. Trace a smooth line from the deep belly up through the fingertips as if those champagne bubbles in your spine could float all the way up to the sky. Do you sense any wrinkles or kinks distorting an even, graceful arc in the spine? If so, nudge the hip points upward toward the heart while inviting the deep belly to slide gently inward to support the front spine. At the same time unclench your lower back and release your tailbone downward. Let the back body be broad and unwrinkled, and nestle the front body into its welcoming support. As you do this, keep the heels fully grounded and the fingertips uplifted. We now need to add just one more piece of the puzzle to complete warrior pose. With the heart and head still looking forward beyond the left toes, bend your front leg to a 90-degree angle, bringing that thigh parallel to the floor. If, as you do this, your left knee ends up over the toes instead of the ankle, widen your stance a few inches. If, on the other hand, you have difficulty bending your knee a full 90 degrees, don’t worry - this is a deep action that takes some practice to negotiate with ease. Bend as fully as you can without moving beyond a squared angle in the front knee, while maintaining integrity through your upper body and grounding your back heel into the floor. While preserving a long, swan-like feeling in the neck, gently gaze upward. To help maintain integrity in the spine, imagine your eyes are in your collarbones instead of your head, and look upward from there. Be light and expansive in the heart, reaching toward the sky with enthusiasm. At the same time, be firm in the legs, keeping the back leg straight and well rooted, while settling with power and presence into the front leg. Resist the tendency to lean forward or backward, and instead align the shoulders directly over the hips so that you stand firmly in the present moment. After several breaths, reverse your movements to release out of the pose. 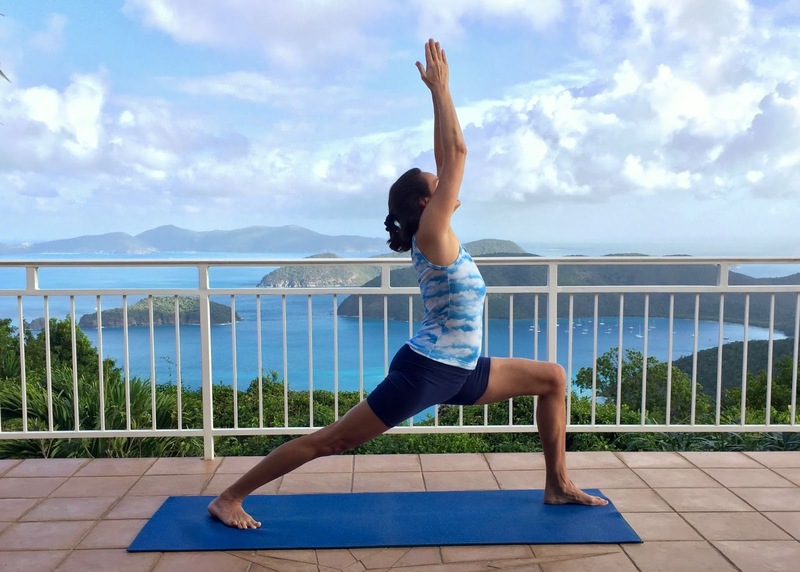 As you repeat virabhadrasana on the second side, invite your mind to move beyond body parts to infuse the pose with deeper fullness and integrity. After you’ve mindfully and methodically positioned yourself in a well-aligned warrior, encourage your awareness to seep into every cell of your body, from the heels right up to through the fingertips. Encourage your warrior to be graceful, expressive and elegant, rather than mechanical and controlled. Trace an imaginary line from your deep belly all the way down through each leg and enjoy the sense of presence and steadiness this cultivates. Trace another line from the deep belly upward through the fingertips and soak up the inspiration and possibility this evokes. Extend your sense of self outward in all directions, filling your skin completely with abundance and vitality. Without sacrificing even an ounce of your inner vibrancy and strength, soften the contours of your skin so there’s room for the breath to support and enliven the pose. As you inhale, pull the breath deep into your body as if you had lungs in your heels. As you exhale, invite your spine to bubble upward as your breath sweeps out through your fingers. Now invite virabhadrasana to be an expression of something greater than yourself. Let it be an opportunity for grace and harmony to reveal themselves through your body. Grow as spacious and majestic as possible, absorbing the beauty and exhilaration of the moment. Enjoy the magnificent strength and presence this lovely posture evokes. The broad stance of your legs offers feelings of earthiness and embodiment. The upward sweep of your spine invites you to reach with inspiration and enthusiasm toward the sky. You are both grounded and uplifted, living firmly in the present moment while reaching gracefully toward the beauty and transformation that still lies ahead.